As he said he would, FCC Chairman Ajit Pai had the Commission release a draft Notice of Proposed Rulemaking on the Open Internet yeaterday. If passed, the changes proposed by the Chairman would include re-instating the classification of all internet access services, including both fixed and broadband, as information services. That means they’d revert back to being treated as private, rather than commercial services, an FCC official explained to reporters. In 2015, the internet access services were re-defined as common carrier services, Inside Towers reported. The Chairman said this week the change stifled broadband investment and deployment, especially in low-income urban and rural areas. Re-defining the internet as a common carrier inhibited broadband infrastructure investment, especially in rural areas, according to FCC Chairman Ajit Pai. That’s why he circulated among his colleagues a Notice of Proposed Rulemaking yesterday to seek comment on reversing the two claims of legal authority that underlay the 2010 and 2015 Open Internet Orders. He intends to release the draft text today and have the item up for a vote at the FCC’s next open meeting on May 18. In his first speech at the spring NAB show as chairman, Ajit Pai said Tuesday that after four years of attending the show and presenting in smaller panel discussions, speaking on the big stage brought more notice and pressure. But he delivered in a big way. Pai intends to do away with unnecessary and outdated broadcast regulations, noting that many of the media rules are “decades old.” He circulated a Public Notice to his colleagues yesterday to begin a review and plans to tee that up in time for a vote at the May 18 public meeting. John F. Kennedy said, “Change is the law of life.” That’s certainly true of broadcasting, said NAB President/CEO Gordon Smith as he opened NAB2017 in Las Vegas. Though the devices consumers use to access their video and audio content continue to evolve, broadcasters remain committed to serving their communities, yet also continue to innovate, he said. Wireless providers large and small have been asking the FCC and Congress for help to clear away regulatory barriers to broadband deployment; they especially have sought help with what they say are uneven prices charged by municipalities for pole attachments and lengthy, costly delays to siting wireless infrastructure, Inside Towers reported. The FCC yesterday voted 3-0 to open a Notice of Proposed Rulemaking to accomplish these goals; it invites public comment on regulations for pole attachments such as how to ensure pole attachers are not charged multiple times for certain capital costs and establishing a shot clock for FCC consideration of complaints. FCC Commissioner Mignon Clyburn is decrying at least one change the FCC is slated to vote on tomorrow regarding tower siting and rights-of-way. 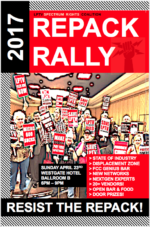 The LPTV Spectrum Rights Coalition is gearing up for a court fight to delay the repack. The group is comprised of Low-Power TV station and TV translator owners. “The auction winning bidders need to hear loud and clear that LPTV will not be moving when they want to start testing in a Partial Economic Area, but when we are ready,” says Coalition Director Mike Gravino. Among the largest winners are T-Mobile, Dish, Comcast, and U.S. Cellular. FCC Chairman Ajit Pai called the conclusion “a milestone” and said consumers would benefit from “greater competition and innovation in the mobile broadband marketplace” and additional resources and programming from broadcasters. President Donald Trump met with about 20 CEOs, including Tesla CEO Elon Musk and IBM CEO Ginni Rometty, on Tuesday in a strategic and policy forum. The executives spoke with five cabinet secretaries about issues like infrastructure, tax reform and job creation. The meeting occurs as Congress is on a two-week break. The White House confirmed the meetings but did not immediately disclose all the participants. Wireless companies are eager to get their hands on spectrum being cleared by television broadcasters. 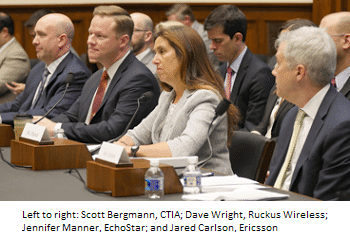 CTIA VP Regulatory Affairs Scott Bergmann said more than once during a hearing last week on future spectrum needs, the organization supports a smooth 39 month repacking process. The first meeting of the FCC’s new Broadband Deployment Advisory Committee is set for April 21. The Commission received 380+ applications for the group. What Nixed the FirstNet Bid for Rivada? Why did the U.S. Court of Federal Claims favor AT&T for the FirstNet contract? Inside Towers reported the award was made last week for partial funding and the right for the carrier to build, deploy and operate the nation’s first nationwide wireless broadband network. April is infrastructure month at the FCC. Chairman Ajit Pai plans to have four telco-related items teed up for a vote at the April 20 meeting.